Vocal provides Free independent advocacy. Vocal has a contract with the Devon Advocacy Consortium to provide statutory advocacy as detailed in The Care Act, support people to make health complaints and Issue based Advocacy for people who have a learning disability or communication difficulty, primarily in South and West Devon and Torbay. We also hold a small contract to support parents with a learning disability who have children subject to child protection proceedures, living in Torbay. Our advocates use a wide range of techniques and strategies – including technology and other media, to ascertain the views and wishes of people who have complex communication needs. We are also able to provide advocacy for people who do not meet the eligibility criteria set by DAC or Torbay. Usually this is funded by our own fundraising efforts, charitable donations or by Grants. There are some instances where funding may need to be agreed with the care provider or funding authority. We work to the advocacy code of practice and will not charge service users for advocacy. If you are not sure whether you meet our eligibility criteria please contact the office. 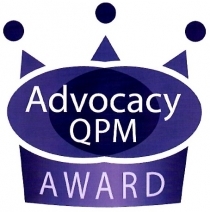 Vocal Advocacy has been awarded the Advocacy Quality Performance Mark (QPM) by the NDTi. This is the only advocacy quality mark for organisations offering independent advocacy. The Quality Mark is only awarded to organisations who can demonstrate that they provide excellent serivces. Vocal is incredibly proud to have achieved this award and have its work validated in this way. The award is valid until March 2019. If you would like to read the report please click on this link.